Model cars and track racing are the bread and butter of Hot Wheels, but they might look a little long in the tooth compared to flashy console games like Gran Turismo and Need for Speed. With the new Hot Wheels AI set, toy autos get a bit of a boost -- not just in speed, but in intelligence. Now you can race against a computer in the real world, right there on your living room rug. 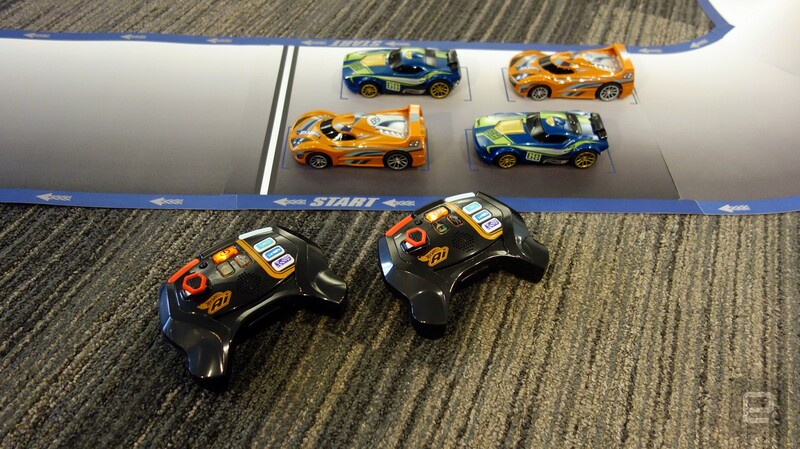 Each Hot Wheels AI set comes with two cars, 20 pieces of track and two controllers. The 1/32 scale models look like normal toy cars, with snazzy shells not based on any existing real world vehicle -- the blue design is called "Fast Fish" and the orange one is "Spin King." Flip them over and underneath you'll find two infrared sensors similar to the ones on a Roomba. They allow the computer inside to "read" the gradient pattern on the vinyl track, so it knows exactly where the car is and can adjust the steering to stay on course even in the middle of a heated race. The track pieces can be arranged in over 40 layouts, allowing you to add turns and straightaways to your hearts' content. That's not the only thing about Hot Wheels AI that can be customized -- the shells can be swapped out for new designs, and the wheel rims are interchangeable as well (gold-plated and spinning options not yet available). Once you've got everything to your liking, it's time to race. 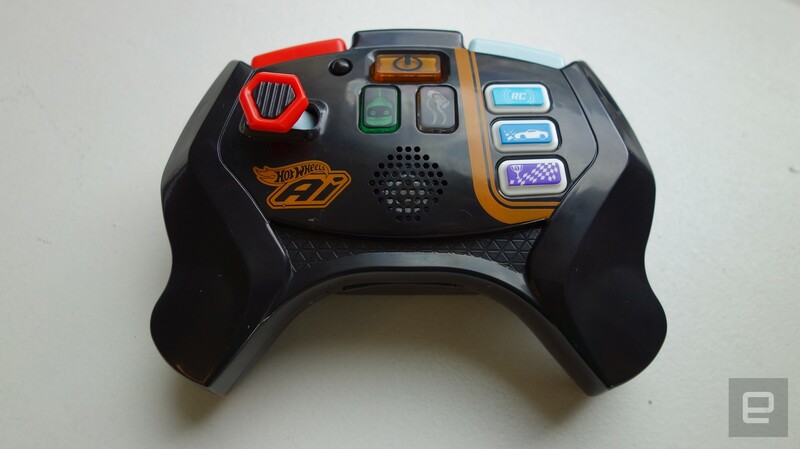 There's no app or anything like that -- Hot Wheels AI comes with special controllers that connect at 2.4GHz to each car. They have a very video game flair to them: The shape resembles an Xbox gamepad, and the controls include a directional joystick on the left with two shoulder buttons up top. But that's where the similarities end. The triggers on the back are designed more like those you'd find on a slot car control, and the front has an array of colorful buttons for choosing game modes. There's an autodrive mode where the cars zip around the track on their own. But let's face it: You want to be the one doing the driving. There's a freeplay mode that puts you in full control and lets you take it anywhere, including off track. On the track you might want to try the practice mode. That's just a basic run which lets you try for your fastest time while you get used to the controls. Once you're done practicing, though, it's time to race against another player or an AI in championship mode. That lets you set up a race with a certain number of laps, like 10. The computer will then track the relative position of the cars, with the controller speakers announcing the standings on each lap and eventually calling a winner. Both the practice and championship settings allow you to select from three skill levels: Beginner, Advanced and Expert. The first difference is how much assistance you get from the computer -- beginners just need to hit the gas, and the system will do the work of keeping your car on the road. Expert puts you almost in full control of acceleration and steering. The other big difference in skill level is how fast you're able to go. Beginner putts along at a steady but unexciting pace, while expert takes advantage of the cars' ability to travel up to 5.6mph, the scaled down equivalent of 180mph. The number of sabotages you have is limited by the difficulty level selected: beginners get nothing, advanced racers get two and experts have four in their arsenal. They can be reloaded by driving your car into the "pit area" of the track. It's an optional bend you can add to the side of the track for "repairs," but the AI won't guide you there automatically -- you have to switch to the RC assist function and manually drive your vehicle in. It's not easy, so you're definitely earning that refill. I'm infamously bad at games like Mario Kart (just ask my coworkers), but I still found beginner difficulty to be a little too constraining. I do think it's great for younger kids still trying to figure out the basics. Advanced mode was a little more my speed -- you get enough guidance to keep you on the track, but it's still possible to maneuver around a bit and it's not annoyingly slow. I still ran off the track a few times, especially after being rammed by my human opponents. The AI is a fair enough driver, and a good way to learn the ropes. But for a real challenge you're going to want to play this with a friend or a competitive family member. In fact, the varying difficulty modes make it great for groups of kids. If you have younger siblings, then you know the pain of being told to "go easy" or even let them win. With Hot Wheels AI, an older child can choose the advanced or expert setting and drive to their full potential, while the littler one can still feel like they're participating without getting frustrated by their lack of skill. They might eventually notice their car isn't fast enough, but hopefully by that point (and age) they'll have improved enough that it's time to graduate to another skill level. 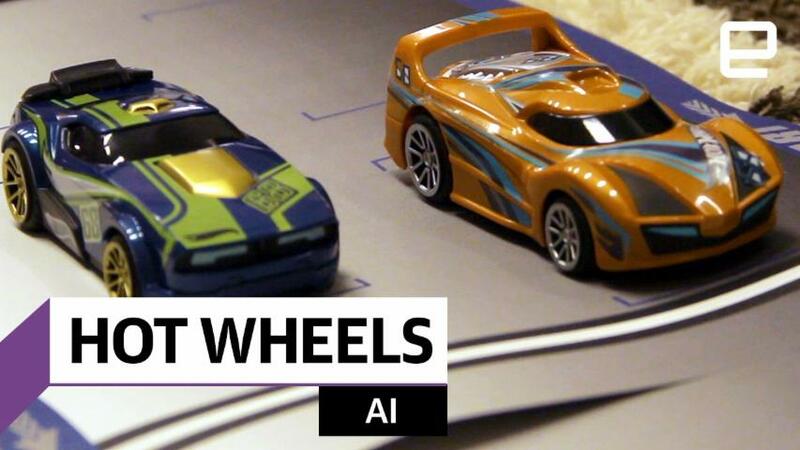 Hot Wheels AI might be aimed at ages "8+," but it really does reach across age groups. 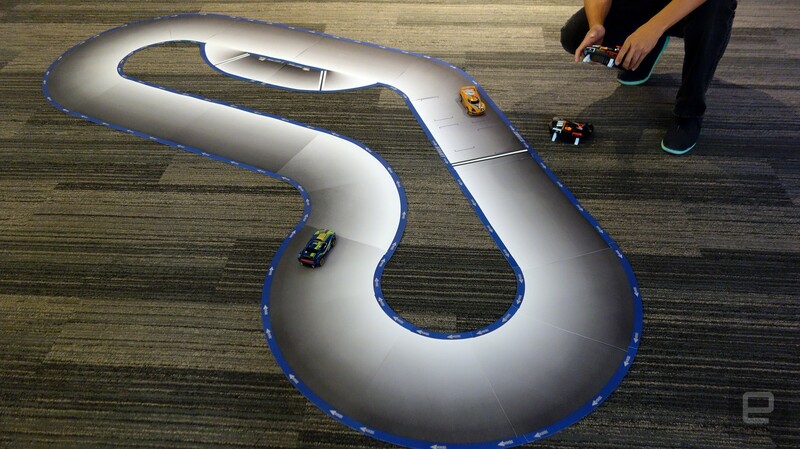 The controllers can be handed off to younger kids, or older adults with fond memories of slot cars and plastic tracks. It's the same classic combination of speed and style that Hot Wheels is known for -- but now it's got some brains on the inside. The basic set goes on sale this October for a sweet $100. This article by Kris Naudus originally ran on Engadget, the definitive guide to this connected life.